Well, almost wordless! Just a little back story for you here. 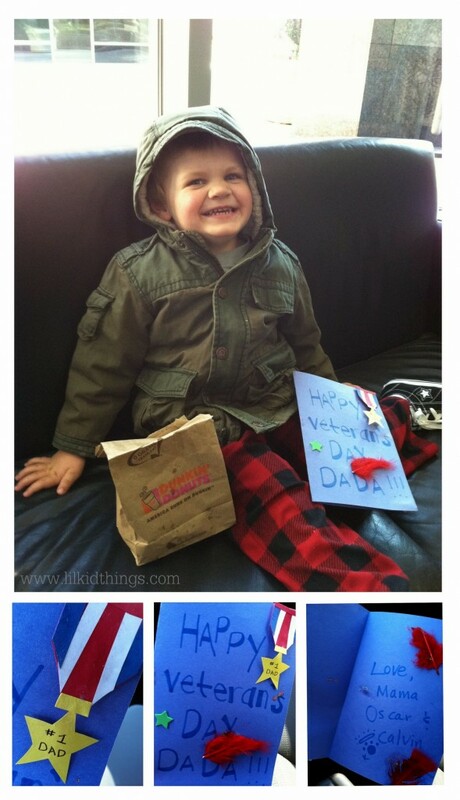 Since last Friday was Veteran’s Day we decided to make a card for my husband to thank him for serving in the Army. I didn’t know him then, but each time I am reminded that he delayed his schooling, his career and basically his future, to serve our country, I am humbled. We decided to make him a medal and bring him a donut as a small way to show him we love him and how thankful we are for him every day. If you are a Veteran and reading this, I am sorry we are out of donuts, but I thank you for your service as well! For more Wordless Wednesday photos, check out these awesome blogs and link up your post below! Love this. Especially Oscar’s face … and the feather decorations on the card. Lily is big into feathers right now, too. That is so sweet! Love that grin!! What a great thing to do. He is so cute. I thank your husband, too.